Life is LONG. But love is always with you and support you every step of the WAY. LONG WAY WITH LOVE, WITH YOU. Long Way concentrates on the inception of stylish design and superb manufacturing process. We believes that each jewelry could add a uniquely feminine touch and you are shining on others mind. 2. Do not wear it when exposure with chemicals, have a bath, and swimming, or it will cause etch to jewelry plating. 1. Please kindly check the picture about the size before purchasing. 2. The image may show slight differences to the actual stone in color and texture. Made of 18K White Gold Plated 925 sterling silver which can retain the color for long time, plus some glistening and eyes-catching CZ stone, pretty and elegant. Suitable for any occasion, easy to match the clothes, a good choice for you to wear every day. Perfect match to evening gown, cocktail dress, wedding dress or blouse and jeans. Standard 3mm Chain. Length: 6.7 / 7.5 / 8.3 Inches. Weight: 0.5 oz.t. 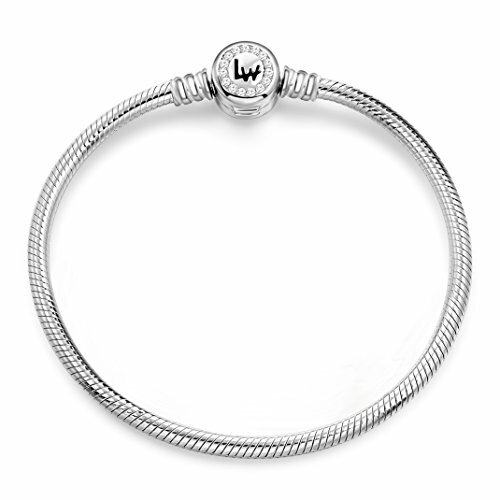 Compatible with most charms charm brand, such as Pandora charms, Troll, Chamilia, Kay, Carlo Biagi, and so on. Light Weight and Comfortable. Comes with brand new jewelry box, and it's perfect for gift giving! Ideal gifts for for your family, girlfriend or friends. 90 Days Money Back Guarantee: Any quality issues within 90 days, please contact us for replacement or refund.